The old White Day event has just gone and the devs of LifeAfter have added a brand new April Event to the game; April Fool Event. 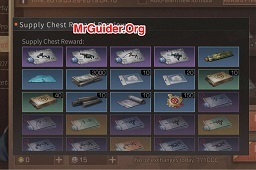 In this event, you have the chance to get event limited gun formula(some people say it blueprints), rare items including Polymer Coating, Film Fabric, and loads of reward. This event is pretty amazing than the events we got after the English Version. The update also added a ton of content, but we are here to share the event details that will benefit all the players. Let’s check it out our LifeAfter – April Fool Event post – Chest Pro, How to earn training badges, lucky hunt, market items, and much more. During this event, you will see loads of chests floating on the water or in the mid-air(with balloons). All you need to do is explore the maps in LifeAfter and grab these chests. For the floating chests, you will have to visit the water areas and dive into there and grab the chests. You will see the mid-air chests often flying in the air. To get these chests, you can use your gun or bow to pop the balloons. After that, the mid-air chest will drop on the ground. Grab it and get the resource point. During this LifeAfter event, you can earn a maximum of 15 resource points. You will get the reward once you earn 5, 10, and 15 points. Once you have 5 resource points, you get new dollar. At 10 points, you get training badges. At 15 points, you get formula shards. As you gain the resource points, you will see the progress in the chest pro tab, displayed in the master level bar. As soon as you hit the maximum points cap at that level, the game will promote you to the next master level. The amount of reward that you get upon collecting the resource points will increase. LifeAfter – How to get training badges? You need training badges to draw items in the lucky hunt, get the items from the market. You can get training badges by completing the Caravan 101 quests. Tap the training option at the top of the game screen -> go to caravan tab -> Caravan 101 -> here you can check the Caravan 101 quests. Send 5 items to Caravan Members during training(In this quest, you send the gift to Caravan members. For example; Rachel is the Caravan Member). Below the NPC name, you can check the title; caravan member, resident, merchant etc. Join 1 Camp Boss Battle; Every Sunday, Camp Boss battle begins in which you visit the mine and inflict damage to the boss. Depending on the progress, you get the reward. During this LifeAfter April Fool Event, you can buy a number of premium items at a low cost. We would recommend you to not to spend these training badges on the useless or common items. Instead, you can use these training badges to get Polymer Coating, Film Fabric or Ally Drill bit(If you need). So this is the complete LifeAfter April Fool Event details. You should collect the mid-air chests, floating chests, complete the Caravan quests, and try your luck in Lucky Hunt. You may get the event exclusive Gun formula. If you have any question, comment below! Previous Post:BitLife – Life Simulator – How To Become Social Media Star?